Fort Buenaventura (1845-1852) - First established in 1845 by Miles Goodyear as a stockaded trading post. Also known as Goodyear's Fort and Brown's Fort. Abandoned in 1852. Established in 1845 by Miles Goodyear as a stockaded trading post near the Ogden and Weber Rivers. 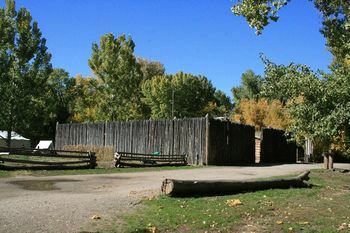 Fort Buenaventura (Good Adventure) was a half acre square stockade with four structures, one at each corner, whose back walls formed the stockade walls. The city of Ogden grew from this settlement. The Fort was sold in 1847 to Captain James Brown, a member of the Mormon Battalion. 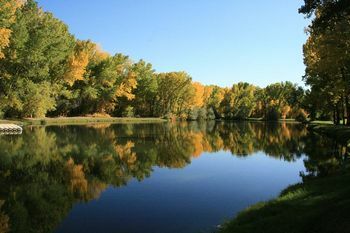 Part of Fort Buenaventura State Park, Ogden, Utah. Stockade reproduced on the original site. 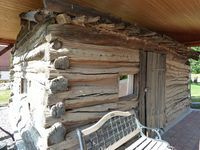 One of the original Goodyear cabins was moved and restored to the Daughters of Utah Pioneer's Museum in Ogden. Location: Fort Buenaventura County Park, Ogden, Weber County, Utah. This page was last modified 10:03, 17 March 2019 by Bill Thayer. Based on work by John Stanton.